“In August 2009″: Larry Keller, “The Second Wave: Around the country, evidence accumulates of a return of the militias and the larger antigovernment ‘Patriot’ movement,” Southern Poverty Law Center, August 12, 2009. “A few months later”: Anti-Defamation League, “Rage Grows in America: Anti‑Government Conspiracies,” November 17, 2009. See also the video of Beck’s fearmongering at CrooksandLiars. 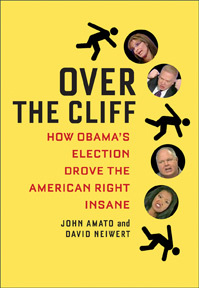 See also David Neiwert, “ADL report on tide of anti-Obama rage calls out Glenn Beck as ‘fearmonger in chief’,” CrooksandLiars.com, November 17, 2009. “As if intent”: David Neiwert, “‘Fearmonger in Chief’ Beck goes militia, warns of impending ‘New World Order’,” CrooksandLiars.com, November 18, 2009. “The ADL report inspired”: Tim Rutten, “Who’s watching Glenn Beck?,” Los Angeles Times, November 25, 2009. “Alexander Zaitchik”: Alexander Zaitchik, “Glenn Beck’s White Nationalist Fans,” Salon.com, November 20, 2009. “Beck never mentioned”: Countdown with Keith Olbermann, MSNBC, November 19, 2009. Transcript at MSNBC.com. See also David Neiwert, “Countdown on the ‘Fearmonger in Chief’: ‘We cannot just dismiss him’,” CrooksandLiars.com, November 20, 2009. “In February 2010″: John Amato, “Roger Ailes defends Glenn Beck’s over-the-top arch-conservative rhetoric: ‘I think he speaks English’,” CrooksandLiars.com, January 31, 2010. “Beck tried to explain”: David Neiwert, “Who you gonna believe? Glenn Beck, or your lyin’ eyes?,” CrooksandLiars.com, February 3, 2010. “As Huffington wrote”: Arianna Huffington, “Glenn Beck Update: The Backpedaling Begins,” HuffingtonPost.com, February 2, 2010. “On Wednesday”: Lou Dobbs Tonight, CNN, November 11, 2009. Transcript at http://transcripts.cnn.com/TRANSCRIPTS/0911/11/ldt.01.html. Susie Madrak, “CNN to Dobbs: Here’s $8 Million, Now Just Go Away,” CrooksandLiars.com, November 16, 2009. “The campaign began stirring”: David Neiwert, “Dropping Lou Dobbs: Unrepentant wingnuttery means CNN needs to choose between its credibility and its pride,” CrooksandLiars.com. “When CNN began running”: David Neiwert, “CNN tries to repair damage with Latinos, but Lou Dobbs remains an open, bleeding sore,” CrooksandLiars.com, October 26, 2009. “Less than a week”: John Amato, “Bill O’Reilly asks Lou Dobbs if Obama is the ‘Devil’,” CrooksandLiars.com, November 17, 2009. “On CNN’s Reliable Sources”: Heather, “Kurtz Brings on Right Wing Talker to Play Concern Troll for Lou Dobbs,” Video Café, November 15, 2009. “Bill O’Reilly invited on”: David Neiwert, “O’Reilly loses bet with SPLC, but still doesn’t get why Dobbs’ firing was a good thing,” CrooksandLiars.com, November 18, 2009. “Edward Wasserman”: Edward Wasserman, “Correct, ignore the lies,” Miami Herald, August 31, 2009. “Near the end of 2009″: Angie Drobnic Holan, “PolitiFact’s Lie of the Year: ‘Death panels’,” PolitiFact.com, December 18, 2009. “Palin was unrepentant”: Rich Lowry, “The Rogue, on the Record,” National Review, November 17, 2009. “In a December 3 interview”: David Neiwert, “Palin boosts the Birthers: ‘I think it’s a fair question’,” CrooksandLiars.com, December 4, 2009. “Palin also embarked”: David Neiwert, “Sarah Palin on Hannity: Just a regular transmission from Outer Wingnuttia,” CrooksandLiars.com, November 19, 2009. “In September 2009″: John L. Perry, “Obama Risks A Military Intervention,” NewsMax, September 27, 2009 (no longer available online). Excerpts at Logan Murphy, “Newsmax: Military Coup Would Take Care Of ‘Obama Problem’,” CrooksandLiars.com, September 29, 2009. “NewsMax eventually”: Logan Murphy, “Cowards: Newsmax Scrubs John Perry’s ‘Military Coup’ Article,” CrooksandLiars.com, September 30, 2009. “Palin staked out her claim”: David Neiwert, “Populism: It’s all the right-wing rage these days,” CrooksandLiars.com, November 24, 2009. “A Fox News poll”: Ernie Paicopolos, “Fox News Poll: Palin Going (Not So) Rogue,” Fox News, November 19, 2009. “As Democratic representative”: Angie Drobnic Holan, “PolitiFact’s Lie of the Year,” op. cit. “By late 2009″: CNN, “Poll: Public shifting blame for recession,” CNN.com, November 20, 2009. “Indeed, the CRA”: Robert Gordon, “Did Liberals Cause the Sub-Prime Crisis?,” American Prospect, April 7, 2008. “Tea Party organizers”: Daniel B. Wood, “Opponents on immigration reform gear up for forthcoming battle,” Christian Science Monitor, January 5, 2010.